An anatomy of woman which is a study of classic stature and proportion, historical, psychological, physiological, social and sexual, as well as a highly civilized commentary on the duality of her role. For against the idealistic projection of the independent woman, there is the reality of her conflict "between the fundamental aspirations of every subject who always regards the self as the essential- and the compulsion of a situation in which she is the inessential". How inessential is seen in the earlier discussion in which woman is viewed by biology, by psychoanalysis, by historical materialism, in myth and legend- and in various cultural eras as her social status evolved upward- to the job and the vote. The feelings she provokes, from transfiguration to enslavement to disgust, have their reflection in the attitudes of certain key writers- Montherlant, Stendhal, Lawrence, Claudel, Breton. Her own development, psychosexual, is traced from childhood to girlhood to maturity and old age; her many identities, as a married woman or mother, as a prostitute or hetaira, are studied in their complex synthesis and opposition. And the ambivalence of the concept of the "truly feminine", the contradiction between her professional interests and the problems of her sexual life, lend a stigma and an incentive to her ascendant progress toward full membership in the human race... Mile. 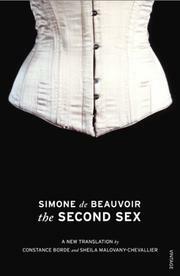 de Beauvoir writes with a personal conviction as well as an impressive literary and cultural background; the translation by Prof. Parshley retains the qualities of an accomplished stylist; and the book has its immediate interest as well as long-term possibilities.